The Following Promos are IN HAND, others may be available by showtime. 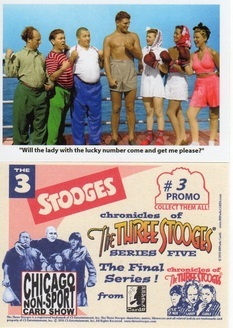 RRParks Trading Cards has provided us with a promo card for their upcoming Chronicles of the 3 Stooges Series 5. The promo has the show logo and is Promo number 3 for the Series 5 set. The promo is for the 5th Edition of The Female Persuasion and features the character Trizia by artist Pedro Perez. The Chicago Non-Sport Card Show series continues with promo number P12 featuring art by our creative guest Jeff Abar. This is promo card number P45 and features art by artist Dan Gorman. It is a companion piece to the promo that was given away at the door last fall. The Chicago Non-Sport Card Show series continues with promo number P12G featuring art by our creative guest Jeff Abar. This is a Metal Promo from our friends at Faerie Metal Photography. 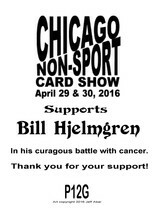 This promo will be available only with a donation to our fund to help long-time dealer and friend of the show, Bill Hjelmgren. Bill is recovering from colon cancer and the related medical issues. Bill will not be set up this show as his treatment schedule does not allow.